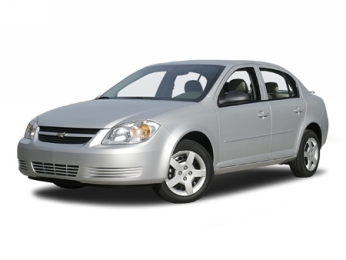 With a broad range of models, offering a variety of well-equipped and sporty choices, the Chevy Cobalt continues to shine as one of the segment�s most popular cars. The Cobalt enters the 2008 model year on the heels of a successful �07 model year, which introduced several significant enhancements, including more powerful Ecotec engines. For �08, the Cobalt builds on that powerful foundation with a streamlined model lineup and more standard safety and convenience equipment. 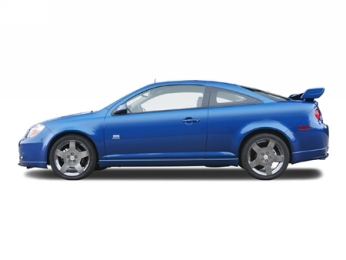 The �08 Cobalt lineup includes LS, LT and Sport models. The SS and SS Supercharged designations have been put on hiatus while the next generation of Cobalt high-performance�s legacy is finalized. Also, the previous Sport Package is now the Performance Appearance Package and is available on 2LT models; it includes a rear spoiler, 16-inch aluminum wheels, stainless steel exhaust with chrome tips, fog lamps, white-face gauges, and leather-wrapped steering wheel and shifter knob. OnStar standard on 2LT and Sport; available on 1LT. And for those who enjoy a broad range of radio selections, XM Satellite Radio is standard on all �08 Cobalts. Cobalt features a strong foundation, rigid body structure, well-isolated chassis and low interior noise levels, thanks in part to the use of Quiet Steel laminated sheetmetal, a premium material not normally found on vehicles in the compact segment. The strong foundation also enhances occupant protection. Precise electric power steering, tuned to each tire/wheel combination, further contributes to the dynamic driving experience. Available in coupe and sedan body styles, Cobalt features smooth and sleek exteriors with fast rooflines. Cobalt is smooth through the air, too, with a coefficient of drag of just 0.324 for both body styles. A myriad of subtle details, such as aircraft-style doors that integrate the door frames into the exterior surface for a tighter, flush fit, contribute to Cobalt�s overall feeling of strength and solidity. Jewel-like headlamps and taillamps exude a premium appearance. The coupe features additional upscale cues, such as Corvette-inspired taillamps. Front wheelhouse liners with molded-in mud/stone guards for LS and LT models. A new Chrome Exterior Package is available on LT sedan models and includes a chrome grille, bodyside moldings and door handles. Cobalt�s exterior color palette is revised for �08; Imperial Blue Metallic, Blue Flash Metallic and Slate Metallic are new, replacing Laser Blue Metallic, Sunburst Orange Metallic and Blue Granite Metallic. From the outset, engineers designed Cobalt to be a responsive, fun-to-drive car. Cobalt�s underbody uses high-strength steel as welded members in strategic locations for maximum strength, structural integrity, mass optimization and crashworthiness. The underbody boasts a rigid bending frequency of nearly 27 Hz. All Cobalt models feature a strut-type front suspension, semi-independent torsion beam rear suspension, and front and rear stabilizer bars for more exact body roll control. Speed-sensitive electric power steering is tuned to match the performance levels of the various tire and suspension packages. FE1 suspension � standard on LS and LT models, it provides a smooth ride and includes a 19-mm front stabilizer bar and a 16-mm rear stabilizer bar. FE3 suspension � standard and available only on Sport, it delivers a firmer, more direct ride and includes 22-mm front and rear stabilizer bars, four-wheel disc brakes, monotube shocks and 17-inch wheels and performance tires. Cobalt�s strut-type front suspension is compact yet provides long wheel travel, with 90 mm of compression travel and 87 mm of rebound, which is substantially more than most competitors and enhances overall ride and handling. Monotube rear shocks are used for a more precise road feel. L-shaped front control arms contain a forward pivot bushing, which transmits most of the cornering force, and a larger, high-damped composite rear elastomeric bushing that allows rearward movement to minimize harshness from road surface impacts. The front control arms are made from steel on the FE1 suspension and are aluminum on the FE3 suspension. The direct-acting front stabilizer bar connects to each strut for precise steering response and improved cornering agility with decreased body roll. All front suspension components are mounted to a rigid cradle assembly comprised of four large hydroformed steel tubes and two side members that are integrally welded to front and rear cross members. The cradle is mounted to the Cobalt�s space frame at four widely spaced points. Cobalt�s torsion beam rear suspension provides excellent ride and handling, while maximizing interior space. A hydraulic rear suspension bushing is employed on the FE1 suspension to improve the ride and suppress road noise. Rear wheel travel, at 126.5 mm in jounce and 68.5 mm in rebound, is longer than most vehicles in the segment. Vented front disc brakes with single-piston calipers and composite rear drum brakes are standard on LS and LT. Four-wheel anti-lock brakes (ABS) are standard on 2LT and optional on 1LT and LS. Four-wheel disc brakes with ABS are standard on Sport. Cobalt also has a standard Enhanced Traction System (ETS) on vehicles equipped with an automatic transmission and ABS. ETS enhances traction by adjusting engine torque if wheel slip is detected. The rigid body structure that lays the foundation of Cobalt�s dynamic driving experience also reinforces occupant safety. In addition to the solid unibody structure, dual-stage frontal air bags are standard and side head curtain air bags are standard. Front seat belt pretensioners, rear center shoulder belts and the LATCH child seat retention system are also standard. Continuous safety is provided by OnStar. OnStar-equipped Cobalt models feature OnStar digital equipment, which also includes enhanced hands-free voice recognition capabilities, including more intuitive continuous digit dialing and improved voice recognition accuracy. OnStar is the leading provider of in-vehicle safety, security and information services in the United States and Canada . Using the GPS satellite network and wireless technology, OnStar features core safety services and OnStar Hands-Free Calling that allow drivers to make and receive voice-activated phone calls using an externally mounted antenna for greater reception. The OnStar service standard on the 2008 Cobalt includes the General Motors Advanced Automatic Crash Notification (AACN) system, making crash data available to the participating 911 centers to help them dispatch the appropriate live-saving personnel and equipment to crash scenes faster. Additional security is provided by the standard PASS-Key III Plus theft-deterrent system, which prevents vehicle operation if the right key is not used. Remote keyless entry and power door locks (not available on LS) provide lockout prevention, delayed locking and programmable operation. Cobalt offers a pair of segment-leading powertrain combinations that deliver an invigorating balance of performance and efficiency. To comply with more stringent emission and diagnostic regulations, Cobalt�s 2.2L and 2.4L engines will receive a new catalytic converter system with slightly elevated exhaust system backpressure. The 2.2L engine is rated at 148 horsepower (110 kW) and 152 lb.-ft. of torque (206 Nm). Cobalt�s standard transmission is a Getrag F23 five-speed manual, known for smooth shifting. Available is the Hydra-Matic 4T45 electronically controlled four-speed automatic transmission. Like the standard F23 manual transmission, the 4T45 is renowned for its smooth and durable operation. In the Cobalt, this transmission uses full perimeter fastening directly to the engine block and oil pan to increase driveline stiffness, resulting in reduced noise and vibration. The 4T45 uses the new Dexron VI fluid and is �filled for life,� meaning there is no scheduled maintenance required for the transmission under normal operating conditions. Separate trim levels for each Cobalt model provide distinction and a tailored appearance. In keeping with Cobalt�s premium positioning, many features are standard, including air conditioning and electric rear defogger. Returning for �08 is an AM/FM stereo radio and CD player with MP3 playback and auxiliary input jack; and driver information center. XM Satellite Radio is standard in all models. Surprising amenities � such as an optional remote vehicle starter system (when an automatic transmission is ordered) � also lend an upscale feel to the Cobalt�s interior, as many of the standard and available features aren�t generally found within the vehicle�s competitive set. The available factory-installed remote vehicle starter system is integrated with the remote keyless entry feature and allows the driver to get a head start on the car�s interior heating and cooling from a range of up to 200 feet (61 m). Additionally, Cobalt features plenty of interior comfort and flexibility, including easy access to the rear seat, 60/40 folding rear seats and interior access to the trunk area, as well as ample, versatile storage. Cobalt interiors reflect a focus on ride comfort, with quality materials and stylish appointments throughout. The seats are designed to reflect the performance level of each model. Cloth bucket seats are standard on LS, while sport cloth seats with driver�s lumbar adjuster are standard on LT and Sport. Leather-appointed heated seats with leather-trimmed steering wheel and shift knob are available on LT and Sport. Changes and revisions to the Cobalt�s interior trim for �08 include an all-ebony upper instrument panel and woodgrain trim on LT sedans with the neutral interior color.